The Mal marry only within their own people group. They are divided into about five sub-castes, and many clans. The marriage symbols for women are vermilion and iron bangles. Most of the Mal are landless laborers. Some sell wood and work as laborers in road construction and forests. They follow both traditional and Hindu religious practices, worshiping Baram, Aram, Gotasila, Rangini, Sitala, Manasa and other deities. They place the Brahmin above themselves and the Kudmi, Bhumij and Santhal below themselves in the caste hierarchy. They live in India and Nepal, as well as in Bangladesh. 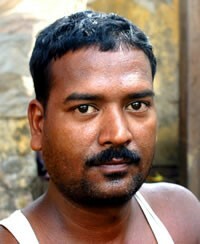 Lack of workers inhibits the advance of the Gospel throughout South Asia. Jesus said to pray for workers. Much sustained and focused prayer is needed to overcome severe spiritual resistance to the advance of Christ's kingdom throughout South Asia. Please pray for prayer groups and prayer networks to form within South Asia, and without. Even though there is no indication today of followers of Jesus among the Mal people, we should pray for those who will soon come to Christ. Pray they will be zealous to know and serve the Lord, and will demonstrate the fruit of God's Spirit, love, joy, and peace. 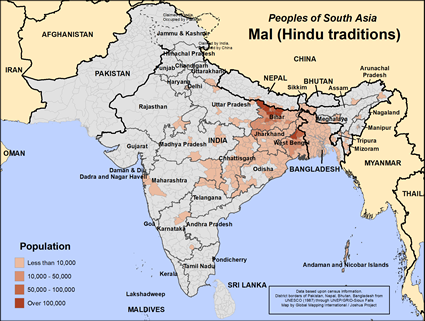 Please pray for the people of the Mal community, in India, Bangladesh, and Nepal. Pray the Lord will send workers to tell them about Jesus. Pray he will prepare them for this, and that they will be given understanding. The worldview of the Hindu is very different from that of the Christian. View Mal (Hindu traditions) in all countries.